Delivering saline solution to a clinic for medical needs … sounds simple enough, right? Not when that clinic is on the International Space Station, the moon or even Mars. Transporting medical fluids that are manufactured on Earth into space is expensive and logistically challenging. NASA Johnson Space Center knew there had to be a way to manufacture medical fluids in space to alleviate the transportation problems and to make spacecraft more self sufficient, so they called on the microgravity science expertise and spaceflight hardware development know-how of Cleveland, OH based NASA Glenn Research Center and ZIN Technologies, Inc. ZIN Technologies engaged Brooks Instrument to help solve this unique flow challenge. V-F Controls, Brooks Instrument's sales representative in Mentor, OH, recommended the Quantim Coriolis mass flow controller. This mass flow controller would be ideal to measure the water flow through a purification system to a standard IV bag that was prefilled with salt crystals and a magnetic lab stirrer. "We chose the Brooks Quantim mass flow controller because of its accuracy at the low flow range the application requires," stated Dan Brown, ZIN Technologies. "Plus, the Coriolis mass flow technology was previously tested by NASA and had already been shown to work in reduced gravity." This isn't the first time Brooks products have contributed to the space program, though. In the 60s Brooks Sho-Rate variable area flow meters (rotameters) were used to leak test space suites. And in the 90s, after the Challenger disaster in 1986, Brooks thermal mass flow meters were used to leak test the space shuttle o-rings. 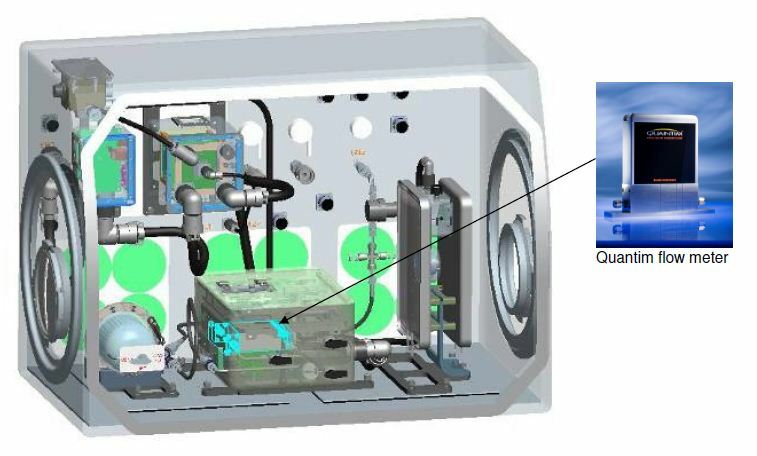 Now, Brooks Quantim Coriolis mass flow controllers are making their way into space to ensure that astronauts have medical fluids on demand for emergency needs. Construction features of the Quantim mass flow controller are critical in this application because not only does it need to work in zero gravity, but spaceflight electronics also typically must pass a rigorous 6.8G RMS workmanship vibration test. The standard Quantim Series proved to be rugged enough for the vibration levels and the long trip to the space station. An initial prototype of the medical fluid generation system called IVGEN (IntraVenous fluid Generation) is currently being installed into a laboratory glove box on the station. The prototype consists of an accumulator for pumping potable water, a filter unit with the Quantim mass flow controller installed, a data collection and control unit, a mixing module, and an IV bag with salt crystals. In operation, potable water is transferred into a bladder inside the accumulator. Nitrogen is pumped into the accumulator forcing the water through the mass flow controller, then through a series of filters, and into the IV bag. The flow rates range from 15-25 mL/min and accuracy is very important in the application. The results from the first test conducted on the station will be returned to Earth and tested for proper filtering and mixing with the salt crystals. Once IVGEN is proven to be successful, the system will be scaled accordingly to meet the requirements of manned missions to the moon and Mars.